Professor Jameson and his immortal band of robot-bodied Zoromes find a derelict space-ship-and in it the deadliest, mind-destroying danger of their careers! Excerpt With a metal tentacle, Professor Jameson pointed to the world in the rear of their passage. At a distance astern of less than twenty thousand miles, the planet still loomed large and commanding, occupying a large section of the star-sprinkled sky within its halo of atmosphere. "It seems strange, 6W-438, that we found no intelligent life on that world." "There are still three inner planets to explore. We may yet find an intelligent species in this system." "Life, even of low intelligence, is the exception rather than the rule," 744U-21 reminded them. "We have found life on but seven worlds in the last twenty-eight planetary systems we have visited, and all but one of these worlds were divided up among two systems. We did gather interesting scientific data, however, in a good many cases." "This system shows signs of being peculiarly well adapted for life forms," the professor pointed out. "We may strike something of interest among the inner worlds." "First, we must explore this lone satellite of the fourth world. It is strange that there is but one moon among all five worlds. Possibly, on closer approach to the inner world, we shall see smaller ones we missed through distant observation." The satellite in question grew on their vision as the mother world behind gradually dwindled. 20R-654 piloted the space ship in a broad, sweeping curve around the little moon. As detectors and divinators of all kinds were trained upon the little moon, Professor Jameson, by the side of 744U-21, who was estimating the satellite's diameter and density, saw that their earlier approximation of seventeen hundred miles diameter was only slightly in excess of the exact. "There is a strong concentration of metal at one spot we passed," 65G-849 announced. "Return that way and we shall seek it out," 744U-21 relayed to 20R-654 at the controls. "Cruise closer to the surface." Close to the surface, in their parlance, meant at an initial safe distance of several miles above any possible spires of rock or mountainous terrain rising up suddenly from beyond the moon's close horizon. They dropped gradually nearer the rough, airless expanse of desolate surface and slowed their speed as 65G-849 reported stronger emanations. At one point, he re¬ported the metallic concentration to be highly localized. Then the ship passed beyond it, for the emanations diminished in strength quite rapidly. 65G-849 made a confusing report, however, as they returned to the point of highest recording. The radiations were weaker. "We have strayed off the line to one side or the other." "No, we were above the same topographical features both times." "Check your instruments again and give specific directions to 20R-654." This was done, and a startling discovery was made. "We are not over this metal concentration! We are under it!" Surprise and interest was immediately manifested by all thirty-eight machine men. "A sub-satellite!" The mysterious object was quickly found. It was small, they noticed, as the ship maneuvered to sunward. "Another space ship-smaller than ours!". 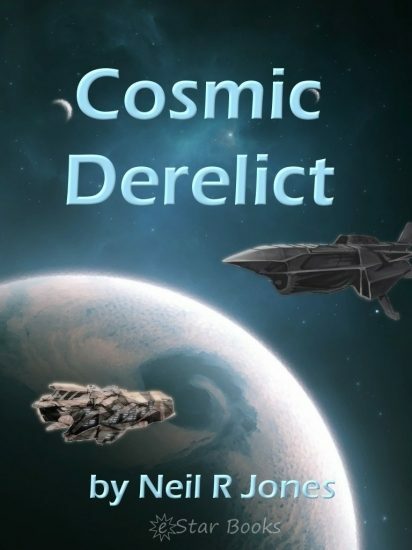 Otros ebooks de Neil R. Jones.